From what I understand, the Piggotts and the Billets were lesser known families in Moscow (compared to such as the McGills, the Hoppers, the Gibsons and the Smiths), both half-English and half-French. Nevertheless, as can be seen from the chart below, they were related to some of these well-known and well-established Moscow-British families by marriage. I have learnt about these families from a biographical book on the Bowe family: "The Faberge Connection: A memoir of the Bowe Family" by Wendy Bonus, where most of the following chart (with some minor corrections and additions on my part) comes from. According to Wendy Bonus, George Piggott "emigrated from St Alban's in England around 1828, picking up a French wife in Paris along the way and producing ten children in Russia, six of whom survived to adulthood. Only one married a Russian national (to be honest, I don't really see that one from the chart. It was Olga, the granddaughter of George Pigott, who married a Russian man). The remaining five married (in order) an Englishman, a French woman, a German, a Scot, and an Italian, and all except the oldest, Julia, continued to live in Russia after they were married, with their growing families." 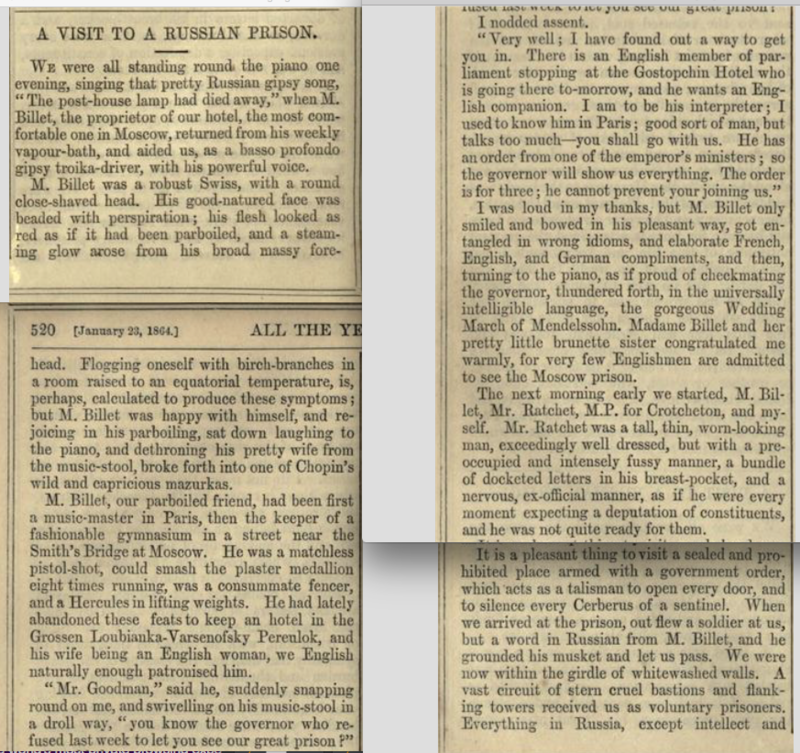 I have found documented proof of the fact that George Piggott indeed made it to Moscow in the late 1820s in the Moscow Gazette (Московские ведомости) of May 1829 - he is mentioned among those who depart for countries outside of Russia: To France, subject of Great Britain Egor, Isaac's son, Piggott, who lives in Prince Golitsyn's house in the 5th block of Myasnitskaya area of Moscow. George Piggott's daughter Sophie Amelie Piggott married Emile Billet, a Frenchman who was known in Moscow as a professeur de gymnastique. Later in his life, as we read in an article by a Mr. Goodman published in 1864 in Charles Dickens' Journal, he "kept a hotel in the Grossen Loubianka-Varsenofsky Pereulok" , "the most comfortable one in Moscow". Sadly, no buildings survived from 1864 in these streets. Sophie and Emile Billet had 3 children. Their son George Billet fell in love with and married a Russian girl from an aristocratic family all of whom were against the marriage. Sadly, the young wife died in childbirth and her loving husband followed her soon after, dying "of galloping consumption". Their only daughter Mollie was raised by her Russian grandparents, but after their death around 1897, she lived for several years up to her marriage with the family of her aunt Emma Billet who was married to Allan Bowe. Allan Bowe was Faberge's partner and had a shop in Kuznetsky Most. ​George and Emma's sister Helen Billet is described by Wendy Bonus based on the memoirs of Wendy's grandmother Essie Bowe Tomlin as "a childless widow having been married to a wealthy carpet manufacturer, Italian by birth but very much 'Russianized'". But Helen Billet's story deserves more attention. There was no mention in the book of 'Aunt Helen's' married name or who exactly her Italian husband was. But finding her husband and even herself on the Internet in Russian proved to be amazingly easy. All I had to do was google Russian Carpet Factory in Zavidovo. Zavidovo is a beautiful area between Moscow and Tver' on the way to St Petersburg. It is rather vast, can be translated from Russian into English as as "the envied" and is now a National Park. 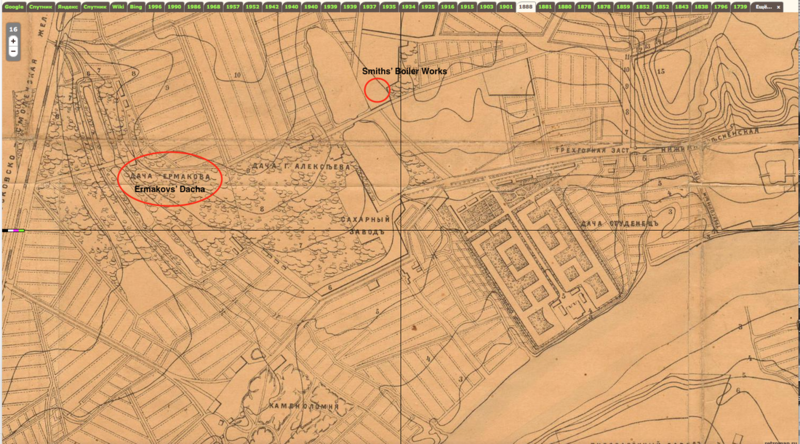 Out of all of this huge area Helen's family owned a settlement Kozlovo on the right bank of the little river Kotevlya. 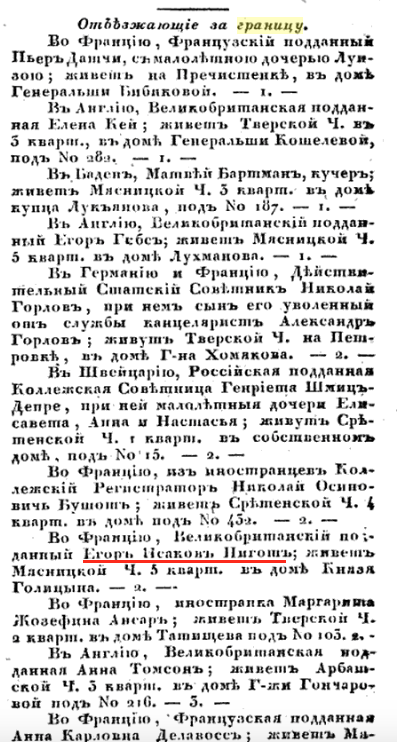 Information on Helen's husband's family comes from different sources, one of which is a historic sketch "Brief History of Konakovo and Konakovo District" by B. I. Petropavlovsky, who writes: "In 1856, 12 km away from the railroad near the village of Kozlovo, an English entrepreneur Flandin purchased from the Russian Government 1300 arpents (=1420 hectares) of land and forests and built a factory to manufacture carpets and rugs, and later silk ribbons and silk fabrics as well. This was the first carpet factory in Russia. The manufacturing began in 1858. By the late 1880s there were 90 ordinary looms, 2 steam engines and 4 steam boilers. Up to 380,000 square meters of carpets and 15,000 tablecloths were manufactured each year." This "English entrepreneur" was Helen's father-in-law. And he was not English. From what I learnt later, he was part-Austrian, part-German, and part-French. 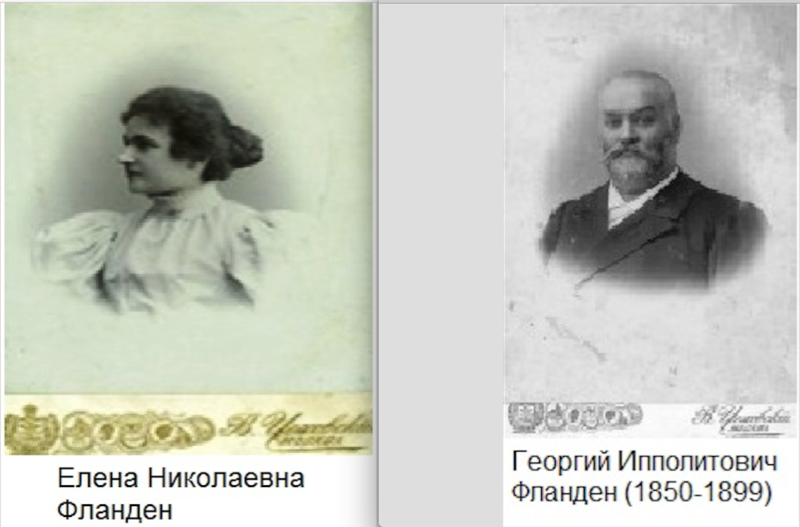 Now that I knew their last name, my further search brought me to the site of the Konakovo Intersettlement Central Library where I found photographs of Helen and her husband (see above) as well as the obituary for her husband who died in 1899 at the age of 49. 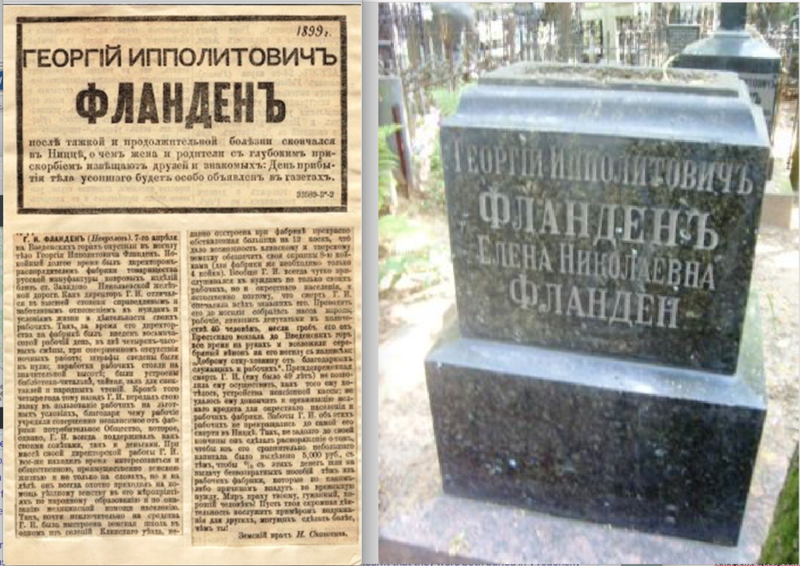 I also learnt that they were both buried in Vvedensky cemetery. I haven't found their graves yet, but it is certainly on my priority list. From the obituary written by the local doctor we learn a lot of interesting facts about Helen's husband, first of all, his name - George Flandin (or, in Russian, with the patronymic, Georgy Ippolitovich Flandin). He died in Nice, France, and was buried in Vvedensky cemetery on April 7, 1899. 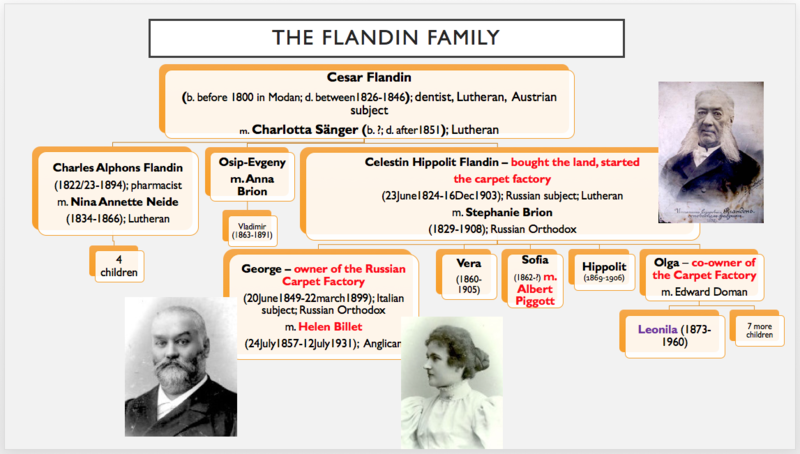 According to the author, George Flandin was a very fair and caring Managing Director of the factory. During his reign he introduced an 8-hour working shift and eliminated night shifts. Fines were brought to nought while workers' wages were considerable. He organised a library with a reading room, a tea-room and a hall for performances at the factory. He leased his own shop to the workers on attractive terms, and the workers managed to organise their own consumer (cooperative) society. Flandin supported it with both advice and money. He also built a school for one of the settlements in Klinsky District, and a hospital for his factory for 12 beds. His death made everyone sad. A big crowd gathered for the funeral. 40 workers were selected to carry his coffin from Brest railway station (now Belorussky railway station) in Moscow to Vvedensky cemetery (which is pretty much the other side of the city). Approximately the same information can be found at yet another site, on the history on Konakovo District. Here we read the following: "Flandin's wife did not leave Russia after the Revolution. It is not clear how she managed to survive: from 1918, when it was expropriated, and up till 1930 the factory did not work. In 1930 it started working again and Mme Flandin got a job as an accountant." At the same site we also find out that during his lifetime George Flandin opened a school of agriculture and in 1880 his father Hippolit built a Russian Orthodox church - John the Baptist's Birth Church, which is still used. The site also provides some more photographs. The factory building is on the left, and the Church of John the Baptist's Birth is on the right. 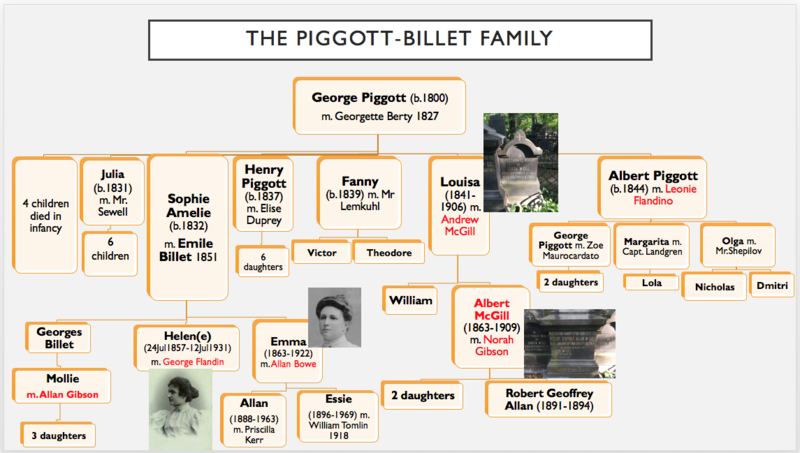 This is George Piggott, son of Albert Piggott (see the Piggott-Billet family chart at the very top). And in indeed, in the 1917 Moscow Address Book we see the following: ​Georgy Albertovich Piggot, hereditary honorary citizen, B.Ordynka 13, flat 19. Tel.436-23. Member of the Board of Directors of the Russian Carpet Factory Partnership. But it is probably not that "Aunt Helen's husband's business had stayed within the family", as Wendy Bonus suggests. It had always been within the family. If you go to the Piggott family tree at the very top you will see that Albert Piggott was married to Leoni Flandino. No matter the spelling, this person is obviously from the same family as Helen's husband - Flandin. 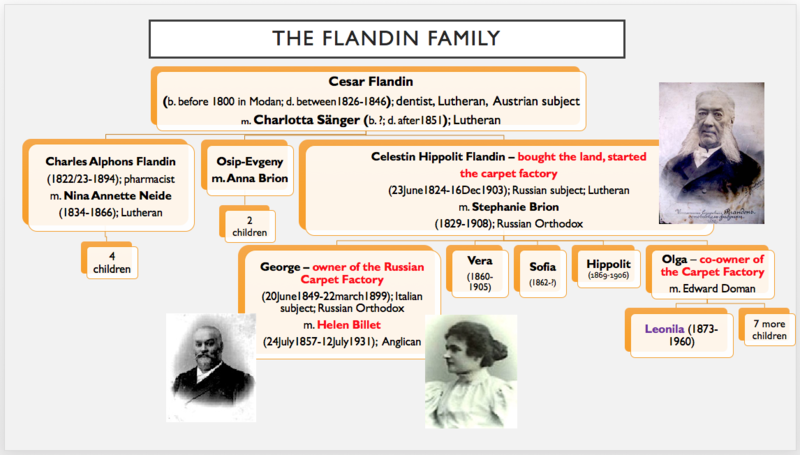 The Wikipedia article on the Flandin family doesn't mention anybody by the name of Leoni Flandin who would be married to Albert Piggott. At the same time, there is Olga Flandin who is mentioned in the Wikipedia article as "co-owner of the carpet factory" and she has a daughter called Leonila (1873-1960). Nothing matches here. Leonila's married name is Sänger, and she is way too young to have been Albert Piggott's wife anyway. But family trees may have mistakes and omissions and it is obvious that something has to match here. 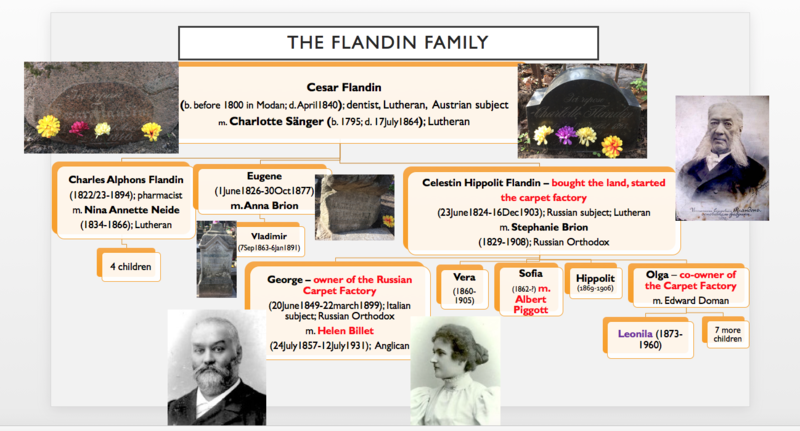 But finally, I found their graves as well, together with the graves of Hippolyte Flandin and his wife Stephanie! And the final observation about Helen Flandin's estate in Kozlovo (Zavidovo). 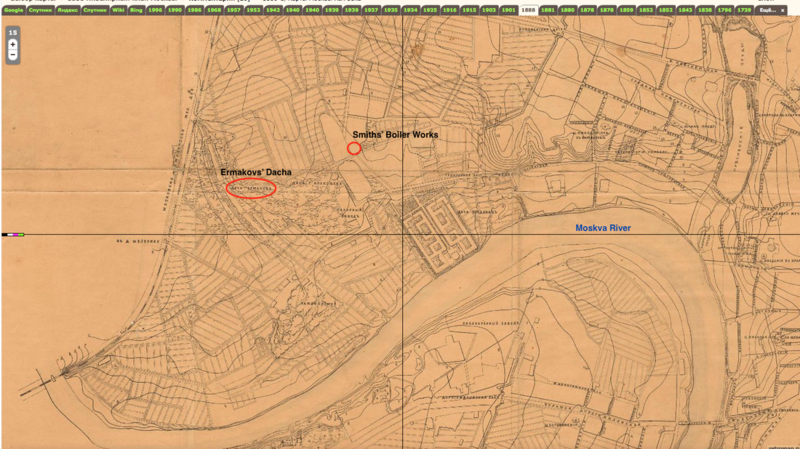 If you look at the map, you will see how close it is to Vysokovsk - the place where Robert and Jane McGill's Cotton Spinning factory was located and where they lived in the 1870s-1880s. It wouldn't be surprising if they enjoyed visiting each other, considering these two families were related!